For Mother’s Day, I would like it if McDonalds’ Corporation would stop targeting children in their marketing campaigns. I know that I have a choice about whether or not to support McDonalds and to tell the truth, on occasion, I do patronize our local McDonalds’ drive thru. In addition, we are shareholders. We also live in the heart of corporate McDonalds’ land and benefit from the corporate taxes that McDonalds pays in Oak Brook IL. I also work at a medical center that has a Ronald McDonalds House, which comforts many suffering families. All of this being said, I continue to wonder, why on one hand, McDonalds Corporation continues to market to children and then turns around and funds children’s healthcare with their mobile services and family care with their Ronald McDonald Houses? Obviously, their bottom line is profit. Parents are encouraged by McDonalds marketing campaigns to view McDonalds as inherently good, when it is not. Perhaps, McDonalds should look at this current generation of parents, who have been exposed to fast food most of their lives, many of whom suffer the ravages of morbid obesity with all of its’ sequelae, diabetes, heart disease, kidney and liver failure. If McDonalds did begin such a healthcare initiative for today’s obese parents, it just might be an acknowledgement of their part, along with other fast food markets, in the cause of this widespread health crisis. One thing for sure is, if McDonalds stops marketing to children, this could be a good thing. If they continue to develop ways to make healthier choices on their menu, this could also be a good thing. If they decrease their unhealthy menu choices, continue their healthcare initiatives and develop new ones. Then and only then, we just might see this new generation increase their longevity and the chances that they will outlive their parents. 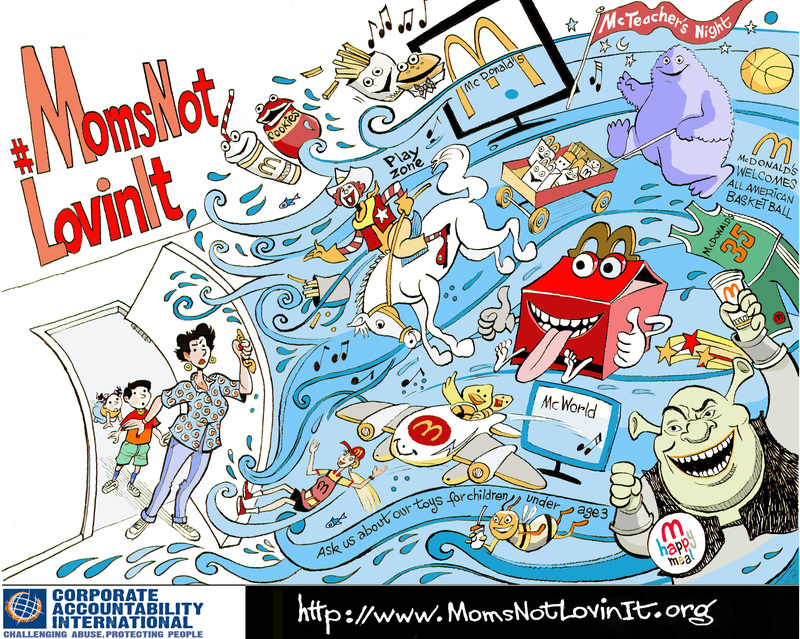 This entry was posted in Family, Feeding, Food, Grandmas & Grandpas, Kids, Moms & Dads, Parenting, Safety and tagged #MomsNotLovinIt, Corporate Accountability, McDonalds, Mother's Day by llpitlwp. Bookmark the permalink.